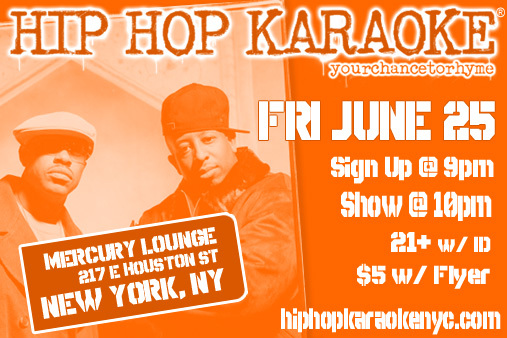 Hip Hop Karaoke NYC :: Blog: This Friday!! This Friday, Hip Hop Karaoke NYC returns to Manhattan! It all goes down at the legendary Mercury Lounge on Houston Street. It's been forever since we've had a regular HHK in Manhattan and we're excited to be back at it. i for one, am very excited. it's gonna be live. the only thing that would make it even liver is Other Guy doing an encore performance of "Ebonics"
What an amazing vibe. Some days, it's a little hot, maybe you're tired and wondering how you'll get the energy to perform and then last night happens and you remember why you keep coming. Your resources of the energy seems inexhaustible! Thanks a million for your efforts, you are a wonderful performer!